For a fleeting moment this week, Londoners will be able to get their hands on an animal-style double-double. According to TimeOut London, In-N-Out will be opening a pop-up on Wednesday in the Camden area in London. It will replace a Brazilian steakhouse from 11 a.m. to 3 p.m. The Camden New Journal is dire in their warnings. 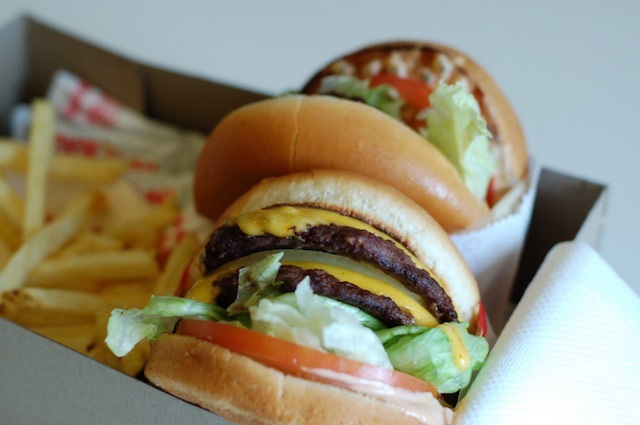 They noted that, in the past, In-N-Out&apos;s overseas pop-ups have been met with a "frantic rush by fans." They said that, when one opened up in Australia earlier this year, people were lining up as early as 4 a.m. Apparently, the scene was "reminiscent of those more regularly associated with the launch of a new smartphone or the latest Harry Potter installment." The crowd was so big that the restaurant sold out in 10 minutes, according to Mashable. And when a pop-up arrived in Singapore in 2012, the store was emptied out in five minutes. Is this a precursor of things to come? Will In-N-Out open a permanent store in another country? That&apos;s very unlikely. As we all know, the In-N-Out crew is famously secretive and inward-looking. While this may sound like a bad business practice, it actually helps the company stay on top of quality control, according to Business Insider. Also, the sense of exclusivity amps up the hype surrounding the famed burger chain. So, no, In-N-Out probably won&apos;t be making the trek over seas. These pop-ups are likely just publicity stunts (albeit some very delicious stunts). Currently, In-N-Out locations are mainly pooled in California, Arizona, Utah, and Texas. There are also locations in Oregon and Nevada. Weirdly, most of the publications cited here (TimeOut London, the Camden New Journal, and Mashable) all describe In-N-Out as a "cult" chain. What&apos;s up with that? Is it a play on the stereotype that all Californians are into Scientology and the Home Shopping Network? And you get a ton of hits when you Google "In-N-Out cult." Anyways. In other In-N-Out news, Anthony Bourdain visited L.A. recently and voiced his love for a good double-double.